Introducing hanger. Part hunger, part anger, let’s party! You know what I’m talking about. Now, don’t get hangry with me. Point is, it’s hard to be nice when your stomach is growling. Why? A dietician at Texas A&M University in College Station has an answer. 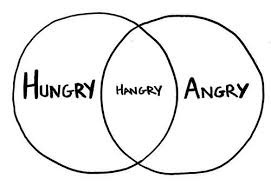 Getting hangry . . . is a survival strategy! It’s all about glucose. Your body converts the food you eat – especially carbs – into glucose, which provides energy. Lots of carbs means lots of glucose. Perhaps most importantly, glucose is brain food. It takes a lot of energy to think! Some studies suggest your brain uses more than half the glucose in your body just while you’re resting. In between meals, the glucose in your body drops. And drops. Your brain releases stress hormones. Which means you’re out of gas – and you can’t even be civil to the people around you. Forget self-control. Your brain is starving! Anger rules! Luckily, say experts, there’s an easy and obvious solution. Eat something! Heck no! Think you’re the boss of me? Why I oughtta . . . Ooh, yummy sandwich!